Prostate cancer (PCa) susceptibility is defined by a continuum from rare, high-penetrance to common, low-penetrance alleles. Research to date has concentrated on identification of variants at the ends of that continuum. Taking an alternate approach, we focused on the important but elusive class of low-frequency, moderately penetrant variants by performing disease model-based variant filtering of whole exome sequence data from 75 hereditary PCa families. Analysis of 341 candidate risk variants identified nine variants significantly associated with increased PCa risk in a population-based, case-control study of 2,495 men. 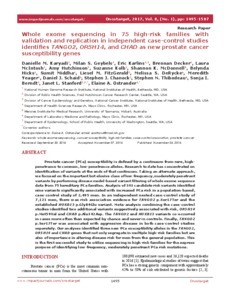 In an independent nested case-control study of 7,121 men, there was risk association evidence for TANGO2 p.Ser17Ter and the established HOXB13 p.Gly84Glu variant. Meta-analysis combining the case-control studies identified two additional variants suggestively associated with risk, OR5H14 p.Met59Val and CHAD p.Ala342Asp. The TANGO2 and HOXB13 variants co-occurred in cases more often than expected by chance and never in controls. Finally, TANGO2 p.Ser17Ter was associated with aggressive disease in both case-control studies separately. Our analyses identified three new PCa susceptibility alleles in the TANGO2, OR5H14 and CHAD genes that not only segregate in multiple high-risk families but are also of importance in altering disease risk for men from the general population. This is the first successful study to utilize sequencing in high-risk families for the express purpose of identifying low-frequency, moderately penetrant PCa risk mutations.